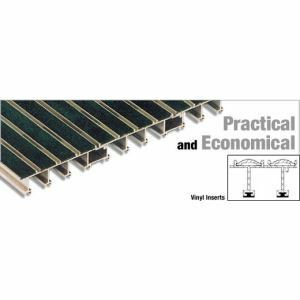 Kadee Industries Arc Clean Tread Model KDVP Entrance Floor Grids help to minimize and control the entry of pollutants into buildings by capturing dirt and particulates at regularly used entrances. Interlocked sectional design and light weight construction allows for easy removal for cleaning. Integral drainage slots keep dirt, water, slush and mud away from the walking surface. Carpet inserts are evenly spaced providing and ADA compliant entry system and safe support for canes, wheelchairs, crutches and other walking aids. Versatile design allows for both level bed and drainage pit applications. Rolling Load Capacity - 400 lbs. per wheel. Tread Rails manufactured from 6063-T6 Aluminum with tread rails spaced on 1-1/2" on center with 2" drainage slots spaced on 6" center. Tread Rail sections sit on vinyl cushions. Polyvinyl Chloride Vinyl Inserts have a serrated, non-slip surface and convex shape. Level Bed embedded frames manufactured from extruded 6063-T6 aAluminum for permanent recessed installation. Drainage Pit frames manufactured from Extruded 6063-T6 Aluminum with welded corner connections and intermediate framing supports manufactured from 1-1/2" x 1-1/2" x 3/16" aluminum angles. Drain Pans (optional) manufactured from 16 gage aluminum sheet may be used as pit liners in Level Bed applications or Drain Pans in Drainage Pit applications.